Beautiful young Elinor Carlisle stood serenely in the dock, accused of the murder of Mary Gerrard, her rival in love. The evidence was damning: only Elinor had the motive, the opportunity and the means to administer the fatal poison. 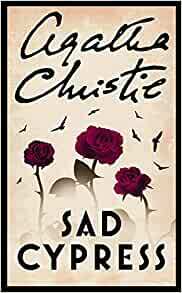 Start reading Sad Cypress (Poirot) (Hercule Poirot Series Book 21) on your Kindle in under a minute. An elderly stroke victim dies without having arranged a will...Beautiful young Elinor Carlisle stood serenely in the dock, accused of the murder of Mary Gerrard, her rival in love. The evidence was damning: only Elinor had the motive, the opportunity and the means to administer the fatal poison. Yet, inside the hostile courtroom, only one man still presumed Elinor was innocent until proven guilty: Hercule Poirot was all that stood between Elinor and the gallows! 5.0 out of 5 starsThankyou Mr Suchet. Whilst reading "Poirot and Me" by David Suchet I came across this title and realised I had never read it. So glad I purchased the book and finally read it. One of Poirot's very early cases and I think his first Courtroom one. A wonderful assortment of characters, some likeable others you'd like to slap! Lots of red herrings leading to think you've solved the murder only for the Poirot to point out the error of your thought process. Proves again why nobody does these stories better than Agatha Christie. A great page turner and one you could return to and curl up with time and time again. First published in 1926, this is an individual Poirot story. Lily Margrave is the paid companion to Lady Atwell. She tells Poirot that Lady Atwell's husband, Sir Reuben Atwell, was found murdered in the Tower Room at his house, Mon Repos. His nephew, Charles Leverson, has been arrested for the murder - having been heard arguing with his uncle late at night by the butler, but Lady Atwell suspects her husbands secretary, Owen Trefusis. Intrigued, M. Poirot goes to the scene of the crime to investigate. This excellent story has all of Agatha Christie's trademarks. There is the country house, an excellent cast of suspects - the brother just returned from Africa, the quiet secretary, the wife who was once an actress, and more. Poirot is though, the cat by the mousehole, as he puts it. When his grand denouncement comes, he has been patient and, of course, solved the murder. For anyone who wishes to perhaps try Christie, these stories are a great way of sampling her work. Agatha Christie never disappoints. Definitely one for her fans. Poirot is the same old genius sleuth and the plot leaves you guessing. I won't spoil it by going into the detail of the plot because it's so readable, aren't all Christie's novels, you can't put it down. If you haven't read this, why not? I've been trying to complete all Christie's novels and short stories and am finally getting there but there are so many and while some of the characters are like old friends, the stories are not of the formulaic kind. Yes Poirot is a genius and in the end his little grey cells solve the case but every book is fresh with new ideas and new twists. Sad Cypress is one of Christie's books which stand out in my memory, and that now and then I fancy reading again. The twist at the end, which is surprising and quite prosaic, the magic of the Christie atmosphere, in between style and tension is there, and the implied importance of heredity and class are almost Victorian! But the most interesting feature as far as I'm concerned is in the character of Elinore Carlisle. Her skilfully repressed passion and devotion echo a side of the British character that often goes untold, and very possibly hints to the passionate side of Agatha Christie herself, who wrote romantic novels under the name of Mary Westmacott, and loved her first husband Archie Christie so intensely as to actually lose her mind temporarily when he left her for another woman (she experienced a brief "fugue" where she lost her memory and signed into a hotel with the name of her husband's new flame). As for plot, narration does feel somewhat disjointed as the story is narrated in retrospective, and in parts through letters, but it really does work, and the ending doesn't disappoint. Poirot joins the story quite late, which makes for a change. Elinor Carlisle remains one of my favourite Christie women. This is an early John Moffatt Poirot. I was very pleased to listen to this dramatisation in one sitting and found it very easy to be wrapped up in the story. As with many Agatha Christie novels there are some good and bad characters and this story leaves open many doors and there are some red herrings too. It is good to have a running time of well over 2 hours allocated because the characters such as Elinor; Roddy; Mary & Dr Lord can be fully developed as in the book. John Moffatt is perfectly cast and there are olds stagers Pauline Letts & Margot Boyd to listen out for too. Lovely atmosphere and sound effects recreate a bygone age. Dramatised by Michael Bakewell and directed by series regular Enyd Williams. Another AudioGo release well worth collecting and a good value item. Vintage Poirot. As is almost always the case, you have to reach the very end of the book before you have any inkling as to who the murdered is. With Christie you can't adopt the Midsomer Murder trick of looking to see who is the least likely candidate and know that that almost certainly will turn out to be the murdered. In Christie's books it might or might not be the least likely person, or even someone beyond that! Or it might be a seemingly obvious person, but somehow she manages to put in so many twists and turns that you end up thinking it can't be. Genius. In this book you get many options - Secret Service, anarchists, family, financial motives, economic de-stablisation motives, personal motives and much more. I guarantee that you will not work out who the murderer is until Poirot, splendid as ever, reveals his, her or their identity/identities at the end. Superb.